Howdy folks! Happy Friday! So, it turns out that the story I posted yesterday wasn't the only thing I ended up writing this week. I also managed to write a sort piece of fan fiction. I seem to have been getting back into that a little bit lately. I haven't written any in years, but this past week I finally had a story that I just had to get out of my head. It combines my two biggest obsessions: Stargate Atlantis and Dragon Age. Thematically it contains some elements similar to "Above the Clouds," but it is definitely a different type of story. To me, the Eluvian mirrors in Dragon Age have always triggered thoughts of the Quantum Mirrors from Stargate. I also have always thought that Alistair would get along well in Atlantis. So I decided to take those two elements and put them together and see what happened. I am pretty happy with the result. I even went ahead and submitted it to Wraithbait (although I had completely forgotten that you have to put in html tags for anything like italics or, you know, line breaks when submitting a story there--that was fun, let me tell you). If I get any sort of positive feedback on the story, I might write some more adventures in this universe. Spoilers disclaimer: MAJOR spoilers for the end of Dragon Age: Origins and hints of characters and events from DAO: Awakening. No real spoilers for Stargate Atlantis, provided you are aware of who is actually in the city as of season five. Other disclaimer: Please note that Alistair and all things Dragon Age belong to Bioware and EA, while all things Stargate belong to MGM. Just the idea for the story is mine. Alistair paused to wipe the sweat from his eyes. Despite the chill of the vicious winds this high in the mountains the exertion of the climb was getting to him. This pass had clearly been carved out by Chasind with a sadistic streak. Or a very disoriented dragon, he thought, smirking to himself. Really it barely qualified as a pass at all, but it was the only known way through this stretch of the Frostback Mountains, and he would complete his assignment or die trying. Looks like the dying part of that is getting more and more likely though. He winced as a new blast of frigid air swept through the range, almost knocking him off of the narrow ledge. Alistair pressed himself against the wall of rock that the ledge followed and steadied himself with a few deep breaths as he waited for the wind to die down again. He continued to make his way through the treacherous pass once nature seemed to have calmed back down. Not for the first time, he allowed himself to wonder what his life would be like now if he had accepted the crown of Ferelden after the archdemon had been slain. I wouldn't be trekking out here in the middle of nowhere, that's for sure, he thought to himself. He still firmly believed that letting Anora remain queen had been the right thing to do, but he had grown convinced that she didn't accept that he believed it. Every time he had call to go to court she could not even stand to be around him, and he knew better than to think it was his resemblance to Cailan. No, his very existence was a threat to her rule and so he made her uncomfortable. As a result, she had somehow managed to convince the new Warden Commander to relegate him to all of the tasks that required extensive (and dangerous) travel throughout the damned country. Such line of thought twisted a double-edged blade right into his heart, however. 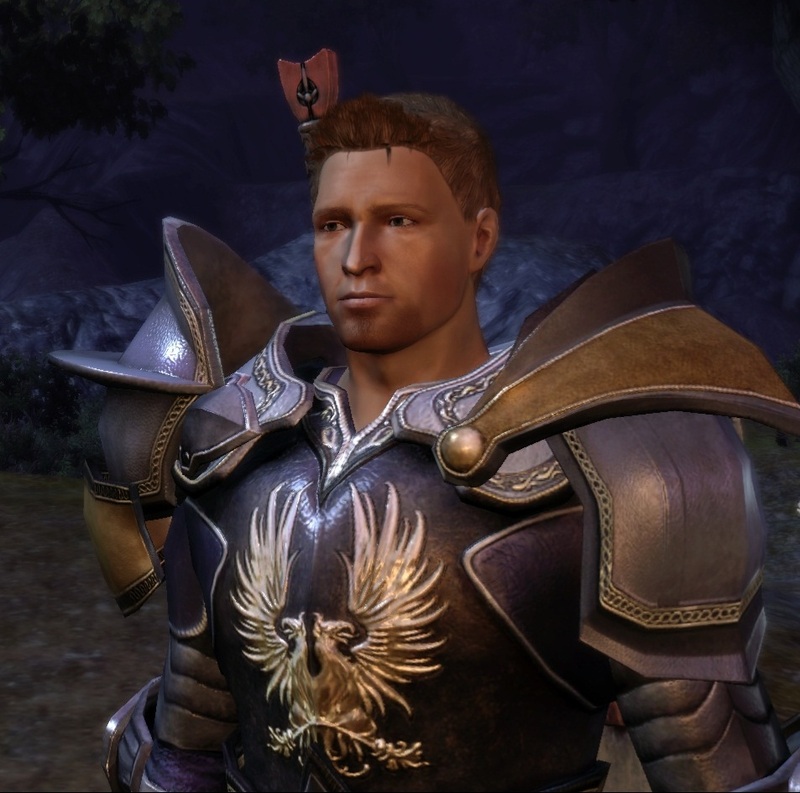 Alistair had no quarrel with the Orlesians, nor with the new Commander that the Wardens in Orlais had sent to help rebuild the order after the Blight. But every time he saw the man it was a reminder of the woman who should be Commander of the Grey Wardens in Ferelden. The love of Alistair's life, his brave and fiery elven mage, the hero who sacrificed herself to kill the archdemon. All because Alistair had refused to swallow his pride, his honor, to grant her one simple request. He had meant to take the final blow himself, of course, but a hurlock, an alpha, had distracted him just long enough for her to strike the dragon first, and with one final spell the Blight was over and she was gone. Thinking of Cailan was no better. Ever since Anora had admitted that Alistair's half-brother had been fully aware of his existence, he couldn't help but wonder why the man had never acknowledged him once they had met, at least in private. He couldn't help but wonder if Cailan had lived, perhaps they might have eventually come to be true brothers to each other after all.... Then again, maybe Cailan would have been just as bad as Goldanna, wanting nothing to do with Alistair unless it was of benefit to her. So here he was, all alone in the mountains, risking his neck to find some elven artifact that the Commander had heard rumors existed. Always alone, even among the other Wardens. None of the faces in Amaranthine were familiar to him these days, save that of Oghren, and the dwarf had his own concerns to deal with. At least out here in the wilds it was less awkward. Alistair tried to shake his depressing ruminations and focused instead on the land around him. By the time the sun had begun to fall from its zenith he realized that the land was leveling out. Shortly after that, it began to descend. He had crossed through the pass and was on his way down into a basin between this range and the next. It appeared to be heavily wooded, which he hoped meant it was his destination. At the very least, he should be able to find a good place to make camp for the evening. As he entered the woods he increased his guard. Likely there would be predators he would need to watch out for, but also, if what he sought was here, then there should be signs of a previous civilization. Even in the shade of the trees, the woods were practically cozy after the winds he had endured in the pass. Alistair soaked up the warmth gratefully as he searched, ever an eye out for signs of his quarry, a likely spot to rest for the evening, or even potential dinner. He almost missed it, the first sign that he was in the right place. He was resting in a small clearing and thinking it would be a good place to stop for the day when a nearby stone caught his eye. Its shape was just a little bit too regular, the moss covering it seeming to follow too decorative a pattern, as if it was filling in crevices that had been put there intentionally. He moved across the clearing and examined the stone, unsurprised to realize that it was part of some larger structure--a paving stone, perhaps, or part of a building. His weariness forgotten, Alistair searched the area for more stones and after a short time found one, and then another, each embedded in the ground. He stepped back and looked at the area in front of him carefully, and after a few moments he could see that the trees in this part of the woods ran a little bit straighter, and there seemed to be two parallel lines of them, evenly spaced. A road had run through here once upon a time, long long ago. Alistair followed the remnants of the road for two hours before he found the ruins. There wasn't very much left to be found, truth be told. But he could see where the foundation had been, and it took little for him to imagine the building that once stood here, centuries ago, when the elves were in their height of power. It hadn't been a very large building, probably just a way-station for travelers coming through the mountains, he guessed. The ruins in and of themselves were an incredible find, and he knew he would have to carefully mark them on his map before he returned. Likely other Wardens, or maybe even the Dalish, would want to come here to study them. But he had not been sent to find the ruins, he had been sent to find something in the ruins, and he feared his luck had just run out. There were no traces of the artifact for which he searched. Still, night was falling and he was tired. He would make camp here and get some rest. Maybe in the morning he would be better able to examine the area. He expected a restless night but perhaps some trace of the magic of the ancient elves still lingered in the ruins. No predators came anywhere near Alistair and he slept far more soundly than he had since joining the Wardens. Even when he didn't hear the darkspawn in his dreams, he remained plagued by nightmares, or even worse, memories of the few happy moments he and his love had spent together before her death. This night, however, he did not dream at all. When he wakes the next day he sets to work combing over every bit of the ruins. His diligence is rewarded when he discovers that a flat round stone tablet set into the ground near the back of what had once been the building moves to reveal an underground room. He can make out the first few rungs of a ladder, as well as an unlit torch hanging on the stone-lined wall. He climbs down far enough to retrieve the torch and brings it aboveground so he can light it, then carefully makes his way down into the cavern. He looks around in awe, sensing from the stale feel to the air that no one has been down here in a very long time. Perhaps not since the fall of Arlathan. Alistair walks to the center of the room, illuminating as much of it as possible with the torch. It is not much smaller than the ruins indicate the building above once was. Probably it was used for storage. A glint catches his eye and he turns to find the source. There, tucked carefully in a corner and draped with a sheet of cloth that looks as if it would crumble at his very touch, is an object that can only be what he was sent here to find. Alistair glances around and notices that there are more torches lining the walls. He lights the one nearest the artifact and replaces the torch in his hands back in its bracket. Then he carefully approaches the object and brushes aside the cloth. He registers a moment of surprise when it doesn't disintegrate, but then he is distracted by the object itself. An Eluvian. The mirror is slightly larger than he is and set in an extremely ornate stone framework. The stone has been carved to quite realistically mimic living trees. It is breathtakingly beautiful. The mirror itself does not give a reflection but instead shows a grey smoky haze. Alistair can practically feel the magic radiating from it. He has done his duty and located the Eluvian. Even better, it is already secured in a very safe location, and he knows that once he leaves it will not be disturbed again until he tells his Commander where it can be found. He knows he should cover the mirror up with the cloth once more, extinguish the torches, return to the surface, mark his map and return home. Instead, he reaches out a tentative hand and lightly grazes the surface of the Eluvian with his fingertips. A soft warm tingle spreads throughout his body, starting where he touched the mirror and working quickly into the very heart of him. He feels a stirring deep inside, in the part of him that was once used by the Templars to dispel and deny magic. Only this time he does not deny it, this time he accepts it wholeheartedly. His eyes reflect the light of the elven script set into the frame as the words begin to glow. Without any further thought Alistair places both palms flat against the mirror. For the briefest of moments the haze clears and he sees the reflection of a room similar to the one in which he stands. Then he is jerked forward and all he knows is the blinding sensation of pain consuming his entire body. He doesn't know how long he lies on the floor before consciousness returns to him, but when he comes to he realizes he is not alone. He can hear a heated argument--one side of it at least--from nearby as he groggily sits up and tries to blink his vision clear. He feels as if he has just been rammed by an ogre, then picked up and slammed into the ground repeatedly by said beast. Every muscle and bone in his body aches. He takes a few deep breaths, trying to steady himself, wondering if he is about to have to defend himself from the intruders. As he tries to get a grip on the situation some of the conversation catches his attention. "Look, I don't know where he came from, alright? Why do you always look at me for an explanation, huh?" There is a mumbled response to the question but Alistair can't make it out. The speaker he can hear continues in a very fast, very irritated tirade, "Look, just because I know more than, well, everyone else, doesn't mean I know everything there is to know, okay? One minute I was studying the device and then he was just falling through it. He almost landed on me. Have you seen him?! He's wearing a full suit of medieval armor! Can you imagine the kind of damage that would have done to my delicate structure?" Alistair has to resist the urge to chuckle. The speaker certainly doesn't sound very delicate. He frowns as what the man said sinks in. Why are the intruders trying to determine where he came from? They showed up after he had...after he had touched the mirror. The conversation outside continues but Alistair has stopped listening. He takes a good look at his surroundings. When he woke up he had just assumed that he was in the underground room in the ruins. But now that he looks around he sees that he is not. It is very similar, but the surfaces are not lined with rock, instead they are a smooth uniform material, like stone but not. The torches are gone, replaced by glowing orbs affixed to the walls. Instead of a few fragile shelves, the room contains a series of strange devices the like of which Alistair has never seen. They appear similar to desks but they are not made of wood, or any material he is familiar with. One directly in front of him is covered with blinking lights and glass panels that are covered in some sort of glowing script. The ladder is gone, instead there is a doorway in the far wall of the room, open to reveal daylight streaming in. Not underground then. The others must be standing just outside the door. Gingerly he stands and turns around, finding a mirror, but not the one that he discovered in the ruins. This one is roughly the same shape and size, but its frame is wholly different. It is made of a similar material to the desks in the room, and it lacks the decorative carvings of the Eluvian that clearly brought him to this strange place. He vaguely remembers Duncan mentioning once that scholars believed Eluvians to be ancient portals, used by the elves to transport themselves across Thedas. Apparently the scholars were right. As he examines this other mirror he becomes aware of the voices from outside getting louder. Alistair turns just in time to see two men enter through the doorway. They are both looking at something one is holding and he realizes it is a tablet that resembles another panel like those on the desk, covered in glowing script. As they cross the threshold the man without the tablet looks up and tenses as he sees Alistair standing in front of the mirror. 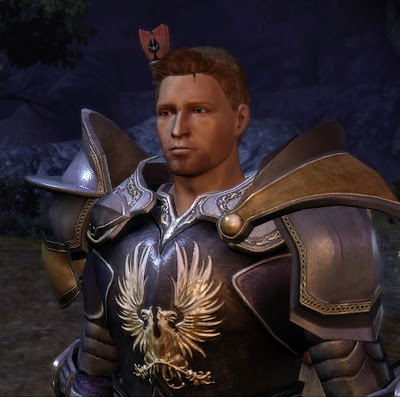 Alistair senses instantly that this man is a soldier, despite his lack of armor, and a dangerous one at that. He tries to look as non-threatening as possible. The other man does not notice, however, and keeps on walking. He begins to speak and Alistair identifies him as the angry man who thinks he knows everything. He doesn't look delicate at all, Alistair notes. "Look, even if it is a Quantum Mirror, and I have to admit, from the evidence, that is looking more likely, we can't really do anything with that information now. Whatever our friend did to get here burned it out. I mean, completely. Used up all of the juice. I mean, yes, I was running a diagnostic at the time, and I guess that could have contributed somewhat, but even if it did--"
"Rodney," the soldier says cutting off his companion's rant. He says it very softly and Alistair knows he was right to call this one dangerous. "What?" The one called Rodney asks in an exasperated tone. He finally stops walking and looks up from the tablet in his hands, his blue eyes going wide as he sees Alistair, just a few feet away. The other man's hand drops to an object strapped to his thigh. Alistair doesn't recognize it, but he'd be willing to bet his last silver it is a weapon. Very slowly he raises his hands in the air, palms up, trying to indicate he means no threat to these people. Rodney lets out a strangled yelp and jumps back about a foot. The sound brings two more people into the room, a wild looking young man only a few years older than Alistair and a beautiful woman that he realizes is just as dangerous as the soldier. Both are brandishing weapons like the one the soldier wears. "Um, hello." Alistair says after a tense moment of silence. When no one says anything in reply he adds, "I'm Alistair. I seem to have gotten a bit lost. Maybe one of you could, um, tell me where I am?" The wild man and the woman keep their weapons trained on him but they glance at the soldier as if waiting for the command. He's the one in charge, then. Alistair is relieved to see that he has not yet drawn his weapon. The man stares at him closely, clearly trying to assess the level of threat he represents to their group. "At ease," he says in that same quiet tone after a few moments. The other two drop their weapons and Rodney relaxes visibly, though not completely. He tilts his head and then gestures to himself, saying "Lieutenant Colonel John Sheppard. This is Doctor Rodney McKay, Teyla Emmagan, Ronon Dex." He gestures to Rodney, the woman, and the wild man. "As for where you are, well, it's more or less the same place you were, just..." he runs a hand through his hair as he trails off and Rodney pipes up to finish his sentence. "...just in a different reality. Well, most likely. I'll need to go over some data to know for sure." Alistair frowns at this answer. A different reality? "You mean, like in the Fade?" he asks, trying to make some sense of what he's been told. That would explain a lot. The Fade is known to contain strange, often inaccurate reflections of real places. "Hmm, maybe, maybe," Rodney answers, looking down at his pad. "Depends on what you think this 'Fade' is, but...hmm." He wanders over to one of the desks and begins tapping his fingers against what turn out to be buttons of some sort. The soldier, Sheppard, shakes his head and looks at his companion with a sort of resigned bemusement. "You'll have to forgive Doctor McKay," Teyla says quietly, moving to stand next to him. Her voice is calm and reassuring, although he can see that she is visibly trying to restrain herself from rolling her eyes. "He tends to get...absorbed in his work. Perhaps it would help if you tell us of how you came to be here?" Alistair starts to protest that he doesn't know but she stops him to clarify. "I mean, what do you remember before you woke up here?" So Alistair tells them of finding the ruins and the Eluvian, explaining that he was looking for it and what his people knew of the artifact. He doesn't tell them everything, there are many details they don't really need, but he tells them more than he would under normal circumstances. He finds himself trusting them almost immediately for some reason. Rodney occasionally jumps in to the conversation to ask him about the elves or the Eluvian or what he means by "magic," about which he clearly feels dubious. Alistair can't imagine why, given the lighting in the room and the objects that Rodney manipulates with such ease. Those seem to reek of magic to him. But perhaps they call it something else here. After a while he tires of standing in the middle of the room and moves to lean against one of the desks. As he does the lights on its surface begin to glow and he can feel the whole of it hum with a soft vibration. That tingle he felt when he first touched the mirror returns. Rodney looks up in surprise when the desk lights up and then glances questioningly at Sheppard. "I hadn't initialized that one yet." "Huh," Rodney says, giving Alistair a hard look of his own. "Well that's interesting." As no explanation is forthcoming Alistair doesn't give it any further thought. The room falls silent save for Rodney muttering to himself, but it is a companionable silence and Alistair finds he rather enjoys it. After a while Rodney slams his tablet down on a flat surface and huffs in frustration, rubbing his eyes. "Rodney?" Teyla asks tentatively. "What have you found?" "Nothing," he answers tersely. "That's the problem. There's not a damn thing in here about how to activate the mirror or how to dial the right reality. We already know there's no remote, we went over the place three times looking for it before Astaire here showed up--"
"Alistair," he interrupts, wondering how the man could have forgotten his name already. "Whatever," Rodney huffs, "the point is, we didn't find a remote, and there's no reference to one that I can find anyway. I mean, maybe if I could download the whole database and go through it in my lab with a team of scientists we could figure out how to get it to work. But there's still the problem of powering the damn thing." "Wait a minute," Sheppard says, frowning. "Back up. What do you mean 'how to dial the right reality?' Nobody's touched it since Alistair came through. Shouldn't it still be set on the correct channel or whatever? I say we go grab a naquadah generator and hook it up to the mirror. This thing can't require that much power, can it?" "Oh, by all means John, do my job for me, please. Yeesh. Are you kidding me? Just hook it up to a naquadah generator? Seriously?" "Rodney," Sheppard says with a warning tone, "you're avoiding the question. Why do you need to know how to find Alistair's reality again?" "Oh, um, well. Remember that diagnostic I said I was running? Well, it might have triggered something that cycled the different realities this thing is connected to and, well, it seems to have kept going for a few minutes after he came through." "Look, we were all caught off guard when he showed up!" He jerks his thumb at Alistair, who isn't even trying to make sense of their words. He furrows his brow as the gist of the conversation begins to become clear though. "Our scans showed this planet to be completely uninhabited, and we know no one has come through the gate since we arrived!" "So we download the database and take it back with us," Ronon speaks up. Alistair jumps. It is the first time he has heard the man speak since he arrived. "You have your people go through it and figure out how to turn it on and get it to the right channel, then we come back, hook up a generator, and Alistair can go home." "Um, no." Rodney answers, chagrined. "For one thing, I don't have nearly enough memory to copy the whole database right now. For another, there are almost an infinite number of realities that thing could be hooked up to, and it's not like they're listed in any sort of order. Also, the naquadah generator isn't going to work. In fact, it's probably the worst possible thing we can do because, well, according to the diagnostic, it is broken. Really broken. Any attempt to bypass it and provide an alternate energy source is more than likely going to cause the whole thing to blow up." The room falls into silence once more as everyone digests this new information. "So I'm stuck here." Alistair says at last. He is surprised to find that he isn't upset at this revelation. "Um, yes?" Rodney says tentatively. Alistair walks over to the mirror and reaches up to touch it. "What are you doing?!" Rodney cries. "All I had to do was touch the other one," Alistair answers. But he knows even before he makes contact with the mirror that there will be no reaction to his touch this time. "Well, yes, clearly the mirror in your reality is working just fine." Rodney sounds a little testy now. "The problem is that you need this one to be working in order to get back, and well," he falters, "it isn't." "Alright then." Alistair says. "So, what now?" There is another long moment of silence and he can't bring himself to turn around and face them. After a few moments, Sheppard is the one to break the silence. "Now, you come and stay with us." "Really?" Rodney asks in surprise as Alistair turns at last. Sheppard's face is serious, and a bit sad. Alistair suspects he feels a little bit responsible for their current predicament. Teyla is nodding in approval, however, and Ronon is giving him an assessing look. Alistair meets Ronon's gaze and after another moment the young man nods just once and looks back to Sheppard. Alistair looks at Rodney who glances at the desk that lit up at Alistair's touch and then shrugs and says to Sheppard. "Might not be a bad idea." He gives a little bit of a chuckle and adds, "Woolsey is gonna love this." They gather up their belongings and Alistair follows the group out of the building and along an overgrown path. There are no woods, but the mountains could be identical to those he came through at the start of this strange journey. Before they get to the pass that would lead back to Ferelden (or whatever stands in its place on this side of the mirror) they come upon a large ring standing up against the mountain face. In front of it is a small podium of some sort that Rodney walks up to. He presses a sequence of buttons and there is a rumbling from the ring. Alistair jumps backwards as there is a loud "whoosh" sound and a jet of something resembling water shoots out horizontally from the center of the ring before settling back and leaving what looks like a standing pool shimmering across its surface. It is beautiful. Teyla places a reassuring hand on his arm and promises him this will not hurt, although it might feel a bit strange his first time through. He sees Sheppard talking to thin air and hears him identify himself and say something about clearance and a visitor. After a few seconds Sheppard nods and gestures toward the ring and one by one, they step through. This sensation is no less strange than his journey through the mirror, but much more pleasant at least, and when he emerges he is still standing and fully conscious. A fact he is quickly glad of as he looks around and finds himself inside a gleaming building bustling with people and more objects like those in the room and Rodney's tablet. A feeling of belonging, a sense of home, unlike anything Alistair has ever felt in his life washes over him. He looks at Sheppard and sees that the other man is watching him take it all in with an open grin. "Welcome to Atlantis Alistair," he says. Thank you for this. Seriously. I think you just made my life.